Here’s a quick look at the Bedfordshire League and cup games this weekend. Caldecote v Sandy: It’s a must win game for the home side if they are to climb out of the bottom three. Flitwick Town v Shefford Town & Campton: Shefford look for their first win in four away outings. Sharnbrook v AFC Kempston Town & Bedford College: If they have won in midweek Sharnbrook will be looking for their sixth home win on the bounce. Wilstead v Ickwell & Old Warden : Wilstead look for their seventh home win on the bounce. AFC Oakley M&DH Reserves v Henlow: M&DH look for the points to stave off a bottom place finish. 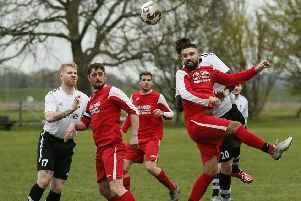 Potton Town v Stevington: Stevington look for the points that could win the title if Sundon Park Rangers slip up at Westoning. Westoning v Sundon Park Rangers: Rangers need to win to set up a title decider against Stevington. Queens Park Crescents v Ickleford. Kempston Athletic v Marston Shelton Rovers Reserves: It’s a bottom three basement battle at Cutler Hammer. AFC Dunton v Wilstead Reserves: Only a win win do for Wilstead if they are to stay in the silver medal hunt. Henlow Reserves v Caldecote A: Only a Caldecote win will do if they are to claim second spot and the silver medals. Ampthill Town U18 v Renhold United Reserves.